The jackpot for Powerball Lottery has been won, the next jackpot is: $289 Million! What is the Irish Lottery Jackpot for 2015-02-04? | €9 Million | It is a Rollover! What is the Powerball Lottery Jackpot for 2015-01-31? | $TBACashValue:TBA Million | It is a Rollover! The jackpot for Irish Lottery has been won, the next jackpot is: €8.5 Million! What is the Euro Millions Lottery Jackpot for 2015-01-30? | £20 Million | It is a Rollover! What is the Powerball Lottery Jackpot for 2015-01-28? | $TBACashValue:TBA Million | It is a Rollover! The jackpot for UK National Lottery has been won, the next jackpot is: £12 Million! The jackpot for Powerball Lottery has been won, the next jackpot is: $208 Million! What is the Euro Millions Lottery Jackpot for 2015-01-23? | £30 Million | It is a Rollover! While I do believe all banks are essentially a type of lottery or more appropriately a ponzy scheme, chances are they are not going to pony up any amount of cash in an absurd thing like a free lottery. Firstly, if we allow common sense to take the soap box, it will tell us that Banks like you to be in debt and paying THEM money... not the other way round. Chances are you have received a 419 advanced fee fraud scam email named after the 419 form that victims typically would need to fill in. They send you an unsolicited email claiming you have won a large prize and to send them some personal information. You get very excited and send them the information as quick as you can. You thank them and start to share how you are going to save the world. They get excited too and tell you what a saint you are and that your funds are on the way. You immediately place an order for a new Bentley and tell the boss to take a hike. You get in touch because your funds have not arrived. They are very 'embarrassed' and promise to look into it (they ignore you for a week). They come back and say not to worry, the funds are pending banking fees that need to be paid, would you mind so terribly to pay the $100 for the payment release fees. You pay the money and wait. You contact them again and again they are very apologetic and you go through the same process, this time you need to pay for an endorsement for a certificate and postage of said certificate to a bank. This time it is $500 (since you are now paying lawyers fees). And here, endeth the 419 lottery scam lesson! 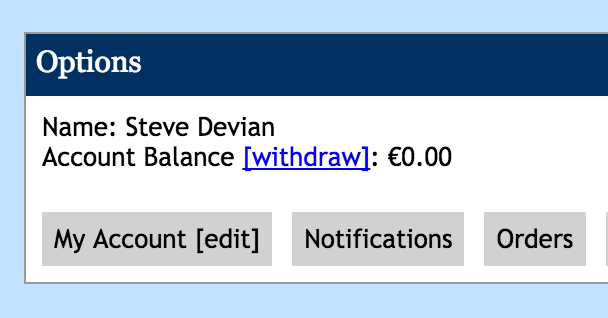 Withdrawing funds is quite simple, all you need to do is click on the "withdraw" link that is displayed next to your account balance and choose the withdraw option. 1. It is simpler for us to pay to the account that you use to fund your payments. 3. Wire transfers are expensive however for larger wins this is not an issue. Once you click on the funding method, an email is automatically sent to our support desk and we will deal with your withdraw as soon as we can. Generally we have a billing run on a monthly basis however we try and refund our players as soon as we can. Withdraw fees are for our clients accounts. We do have other funding methods and you will need to contact us for more information. The jackpot for Powerball Lottery has been won, the next jackpot is: $194 Million! 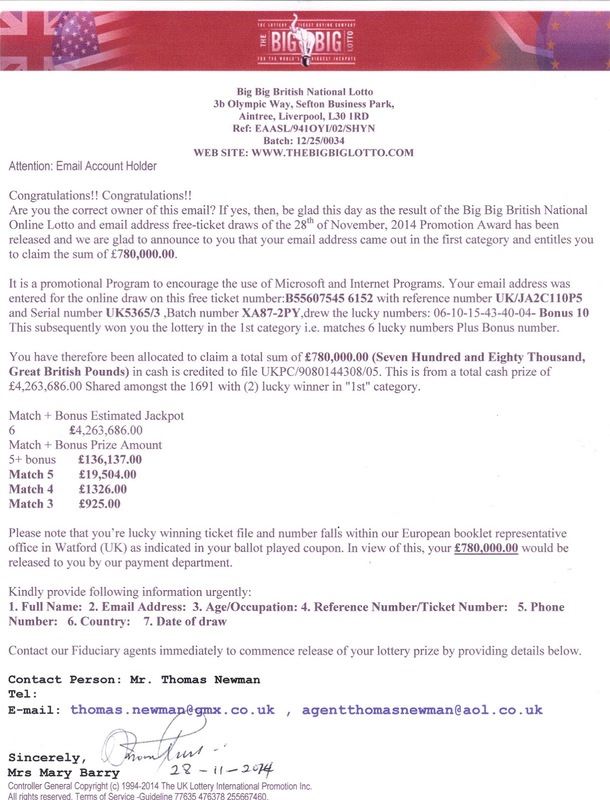 What is the NY Lotto â¬10k Insured Jackpot for 2015-01-17? | $6.5 Million | It is a Rollover! The jackpot for NY Lotto â¬10k Insured has rolled over and you can now play for a massive: $6.5 Million!